I’m going to be blogging the day after taking these photos. I don’t like that so much. The ideas aren’t as fresh in my head, and maybe it’s just this particular batch of photos, but as I was considering what I was going to say, I was slipping more and more into the whole “I’m just going to describe what I took pictures of and why” mindset- kinda family picture slideshow esque. That’s primarily because instead of setting aside time to go shoot, I just brought my camera with me throughout the day. It was in an effort to try to take more portraits, which I did, but it also lost the focus of “go to a place and make a photo that kicks everything off, and then go on a good thinking and photographing romp”. I’ll start this post with the self portrait I took to break the ice of portraiture. As I said before, photographing people is not my strong suit, but it’s something worth figuring out. A lot of the photos I take are empty, and would at least benefit from a few photos around them of people interacting with scenes to try to push out the reading of what’s going on, and how the viewer should feel, about a figureless landscape. 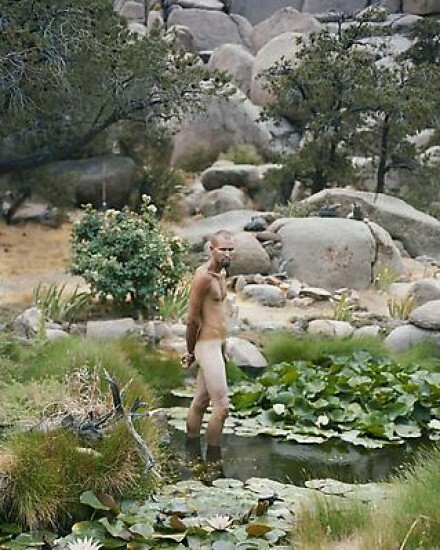 Alec Soth is the king of this, and also has a knack built up over 20 or so years of serious photographic work for finding and making comfortable enough for very specific photographs some very interesting people, like this neo-Nazi desert nomad he got to stand naked in a pool of water for an 8×10 portrait. What a pro. So this is William, and he is a guy from Florida who camped in my backyard for the past two days. I felt like if I couldn’t ask to photograph this guy, who is quite friendly and grateful for the place to stay, I couldn’t ever muster the courage to photograph anyone. Of course this is an overstatement, but still. I finally asked to photograph him, he gave a “I’m smiling for a camera” smile and I left it at that. I had some ideas for a better portrait but still don’t have the skill of posing a stranger. William is on his way from Florida to Vermont on a bike, and linked up with me through a website that connects bike tourers and hosts. We had a good conversation yesterday morning, talked about his life and mine, how he got into touring, etc. It’s certainly something I’ve wanted to do for a while, but William talked about the loneliness of weeks and weeks on end without much human contact other than convenience store workers. There’s the allure of the open road to be sure. I was telling my roommate Will about how some of this project, with the random locations, is an attempt to get that mysteriousness of being in a new place close to home. Because for all the smaller jaunts I’ve done of just driving to a new place and photographing what there is to photograph (of course trying to do The Americans, even when I didn’t know The Americans), I see similar looking places and only pick at the surface. It’s how places get typified, how work like The New Topographics gets made, because in one sense, everything is quite similar, and yet nothing is. And I do want to set out for a bike tour at some point, just to get the wanderlust out of my system perhaps. However I lose more and more stock in the idea that photography is “out there” and needs to be found, like a small town halfway across the country is “where it’s at”, and I just need to go there. These thoughts are a little scattered, but the great American road trip is one of the dominant genres of photography, at least in the later 20th century, and certainly the one I feel closest to, so I guess it needs to be reckoned with even partially. Then I went to a work meeting. I want so badly, and I probably will in the fall, to do a series of portraits of my coworkers and their bikes. They’re all such lovely and unique people, and their bikes become such interesting reflections of their character, their personalities, their aesthetic preferences. They are usually handbuilt and adorned, mechanically and visually different from person to person depending on how they like to ride. It’s no different than clothes people prefer to wear, but it’s just such an interesting manifestation that I want to get everyone in the studio and really thoroughly document that, if only for my own enjoyment and practice rather than a “quite serious art undertaking”. We had a staff meeting, which for us is on the sidewalk outside of our tiny studio space. Major points of discussion were the status of the company in regards to the rise of competition in our area, how we keep our edge and our business strong. The guy in the red shirt is Frank, who started Quickness in 2010. I’ve got mad respect for him as a businessman and person, and he runs the company with authority but also respect for everyone involved, with an eye both on the vitality of the business and adherence to the principles the company was started on. Quickness is a tight-knit group of people and we all love what we do, so I’ve got nothing but admiration for him and his efforts in making it all happen. I took some pictures of my coworkers. The national championships of courier racing are in New York in the fall and I really really really want to go shoot them. It’s such an interesting culture, visually and otherwise. I kept my camera in my bag throughout my shift and periodically shot between deliveries. In Church Hill, where I was working, there are sometimes some pretty decent lengths of time without deliveries, and you’re working the area by yourself, so there’s plenty of opportunity to explore, or sit in a park and read, or whatever, to pass the time as you check your phone every five minutes for new work. There’s a nice view of downtown in one of the parks, and the area itself is quite fascinating, so I’ve really enjoyed the downtime there as an opportunity to explore. Church Hill and Church Hill North (as well as all the smaller neighborhoods which endlessly fracture) are interesting areas because it goes from extremely posh housing to derelict, abandoned properties in the span of just a few blocks sometimes. I didn’t get any great photos of it today (there’s so much there to take photos of), but sometimes there are even two houses next to each other, one completely abandoned and one seemingly renovated completely within the past week, right next to each other. Going further north, which I rarely (if ever) have really done, will land you in the areas of Richmond that are still mostly comprised of public housing projects and are the sections of the city that are still very, very poor. So it’s an interesting place to ride around and see the things happening and think about them. Not sure it’s ever the photographic work I would want to do, in the long term, but it’s there, and I figure the least I can do is to go look at and acknowledge these things happening in our city. See what poverty looks like in the United States in 2016. And there was some sitting about, and then the deliveries picked up a bit, and I sweated and pushed food around on a bike. I was paid for my efforts and then went home, and took no more photos on that day.